Customize your kvm switching system with the mission-critical ServeView Pro line. These versatile switches serve all your platforms, PC/Unix/Sun/Mac. Streamline your server room, increase productivity and reduce overhead with these dependable kvm switches. 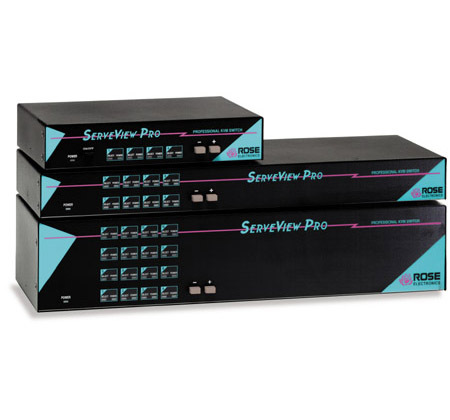 With ServeView Pro switches, you can control up to 256 computers from a single keyboard, monitor and mouse. A range of expandable sizes are firmware upgradable and give you unlimited flexibility in organizing up to 256 computers. Switch between computers using the hot-key commands, front panel control button or RS232 port. ServeView Pro allows simultaneous and automatic booting and operation without a keyboard or mouse connection ensuring problem-free operation of all your computers. The emulation is constant on all ports, preventing lockups during switching and periods of inactivity. The ServeView Pro is operating system independent allowing for use on a variety of operating systems including DOS, Unix, Novell Netware, Windows 95/98/NT/2000, Linux and more. Enhanced models are compatible with a mixture of Sun, Mac, Unix and PC operating systems.